An online merchant is part designer. 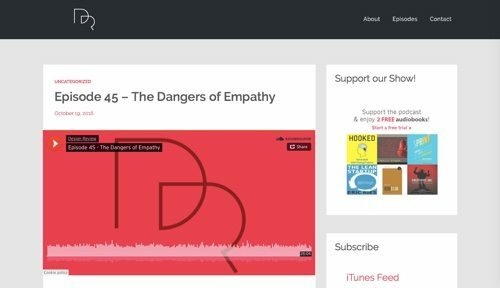 Rather than being overwhelmed with endless design decisions — fonts, images, user experience, layout — find practical solutions and inspiring experts in web design podcasts. 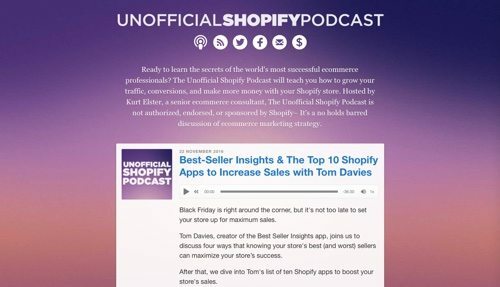 Here is a list of web design podcasts that focus on ecommerce design, animation, user experience, product design, development, design trends, and more. 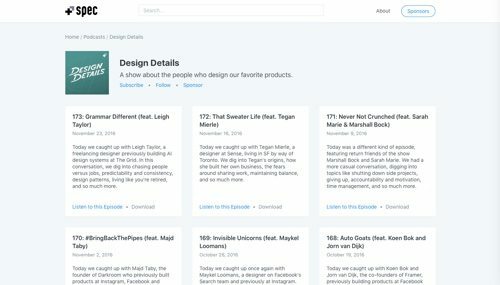 The Design Review Podcast is a bi-weekly show about products and their design. Each episode, co-hosts Chris and Jonathan review a product and analyze the user experience design to understand how it works and how it’s made. Learn the ins and outs of design principles with front-line designers working in the field. 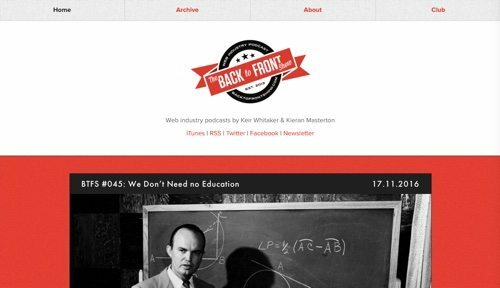 The Back to Front Show was started in 2013 by web industry veterans Keir Whitaker and Kieran Masterton. Over the first 40 episodes they have discussed everything from web design and development to startups and dog-related tech. The current focus includes remote working, working in the web industry, productivity, hipster beards, and much more. The Back to Front Show is released irregularly. 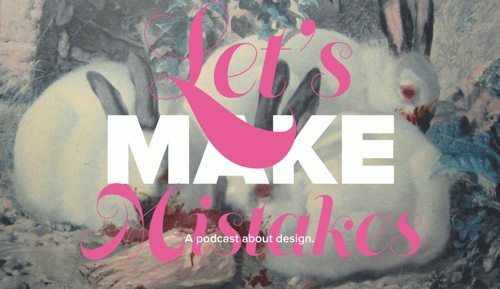 Let’s Make Mistakes is a podcast about design, co-hosted by Mike Monteiro, Liam Campbell, and Steph Monette, creators and developers at Mule Design. 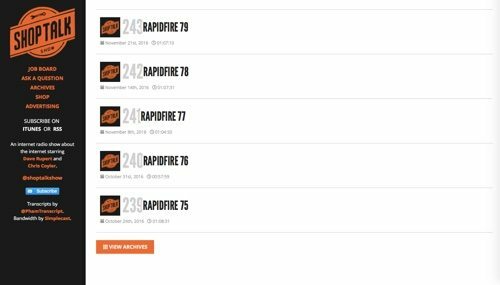 Each monthly-or-so episode features a guest and a wide range of design and online themes, such as being authentic online, music and how it relates to code, and much more. 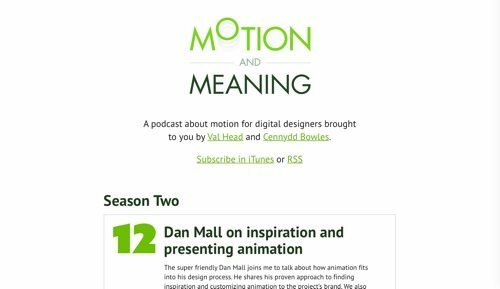 Motion and Meaning is a podcast about motion for digital designers, brought to you by Val Head (an animator and author) and Cennydd Bowles (a designer and author). This show is primarily about how to design and create interactive animation for users. Learn why motion is a tool that you need to pay attention to. 99% Invisible is about all the thought that goes into the unnoticed architecture and design that shape our world. 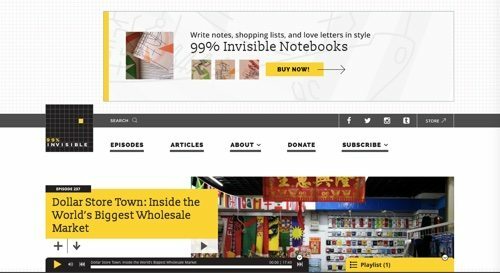 99% Invisible started as a project of KALW public radio and the American Institute of Architects in San Francisco. Originally, host and creator Roman Mars produced 99% Invisible from his bedroom. Roman Mars is also a founding member of Radiotopia, a podcast collective. CTRL+CLICK CAST inspects the web for you, featuring innovators who tackle everything from design, code and content management systems, to culture and business challenges. Recent topics include “Ecommerce Shipping & Fulfillment,” “Marketing for Web Freelancers and Agencies,” and “Securing Site Content.” CTRL+CLICK CAST is produced by Bright Umbrella and hosted by industry veterans Lea Alcantara and Emily Lewis. Hosted by Bryn Jackson and Brian Lovin, Design Details is a show about the people who design products. Shows feature designers and innovators at companies such as Shopify, The Grid, Airbnb, Pinterest, and Zendesk. 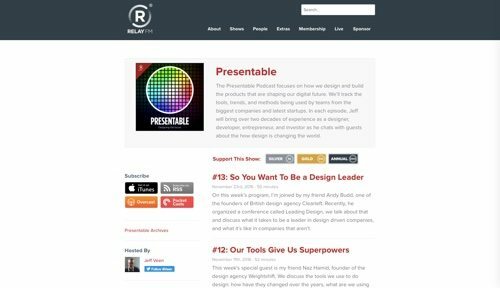 Hosted by Jeff Veen, The Presentable Podcast focuses on how to design and build the products that are shaping our digital future. 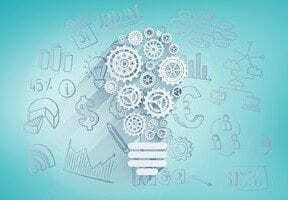 It tracks the tools, trends, and methods being used by teams from the biggest companies and latest startups. With over two decades of experience as a designer, developer, entrepreneur, and investor, Veen chats with guests about the how design is changing the world. 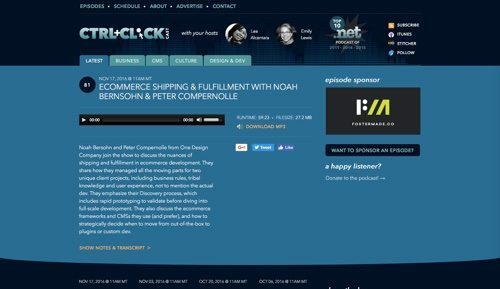 Hosted by Dave Rupert and Chris Coyier, Shop Talk Show is an Internet radio show about front-end web design, development, and user experience. Each week, Chris and Dave are joined by a guest to talk shop and answer listener-submitted questions. 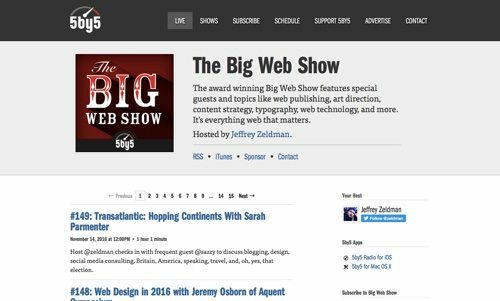 In the Responsive Web Design podcast, co-hosts Karen McGrane and Ethan Marcotte interview people who make responsive redesigns happen. 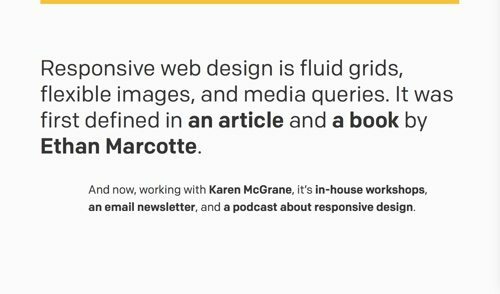 Marcotte wrote the popular book Responsive Web Design, released in 2011. McGrane also wrote a book, Content Strategy for Mobile, and has helped many traditional publishers adapt their content for web and mobile, including The New York Times, Condé Nast, Hearst, The Atlantic, and Time Inc.